Separatists in eastern Ukraine have proclaimed a new state that aspires to include not only the areas they control but also the rest of Ukraine. The surprise announcement in the rebel stronghold of Donetsk casts further doubt on the 2015 ceasefire deal that was supposed to stop fighting in Ukraine's industrial heartland and bring those areas back into Kiev's fold while granting them wide autonomy. It also caught unawares some rebels who said they have no intention of joining the new state. More than 10,000 people have died in fighting since Russia-backed rebels took control of parts of Ukraine's Donetsk and Luhansk regions in April 2014 after Moscow annexed Ukraine's Crimean peninsula. The rebels originally sought to join Russia but the Kremlin stopped short of annexing the whole area or publicising its military support for the rebels. Most of the areas which are part of Ukraine were referred to as Malorossiya, or Little Russia, when they were part of the Russian Empire. Mr Zakharchenko said the rebels are drawing up a constitution that will be put up to a popular vote. "We believe that the Ukrainian state as it was cannot be restored," he said in remarks carried by the Tass news agency. "We, representatives of the regions of the former Ukraine, excluding Crimea, proclaim the creation of a new state which is a successor to Ukraine." Although separatists in the east have sympathisers in other Ukrainian regions, they have not attempted to capture territories there, and they have no political representation. Separatist leaders in Luhansk later denied that they were part of the deal. Local news website Luhansk Information Centre quoted rebel representative Vladimir Degtyarenko as saying they had not been informed of the plans and have "great doubts about the expediency of such a step". Throughout the conflict, the rebel-controlled areas have been ruled by self-proclaimed authorities in Donetsk and Luhansk who call themselves the Donetsk People's Republic and the Luhansk People's Republic. Separatist leaders in Luhansk, unlike their counterparts in Donetsk, have tended to stay away from directly expressing intentions to join Russia. 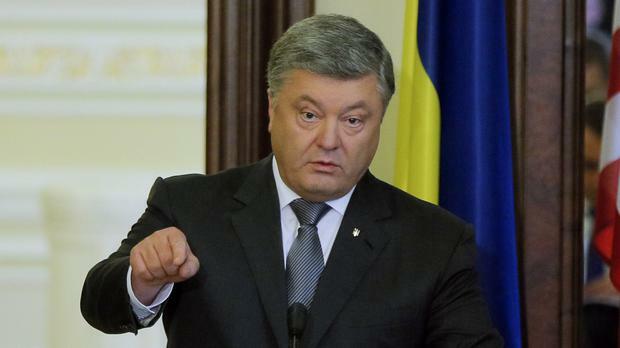 Ukrainian President Petro Poroshenko accused Russia of directing the rebels' hand in making the announcement and seeking to split Ukraine. "You should understand that Zakharchenko and (rebel leader Igor) Plotnitsky are not political actors," he said, dismissing them as "puppets" whose only job is to voice "the messages they receive from Russia". Mr Poroshenko said Ukraine is committed to the peace accords and pledged to restore control over eastern Ukraine and Crimea. France, Germany, Ukraine and Russia worked out an agreement in the Belarusian capital, Minsk, in 2015 which laid out a road map for ending the conflict between government troops and separatists. The rebels and the Ukrainian government agreed that the rebels would return the control of the territories they had captured to Kiev while Ukraine would allow a local election there and grant wide autonomy to the region. The Luhansk rebels insisted on Tuesday that they were committed to Minsk while Donetsk representatives argued that the creation of a new state does not contradict the deal.